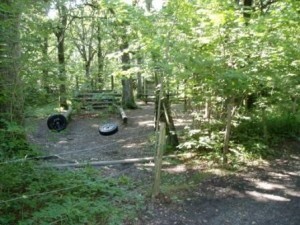 Within our fenced activity area this features swings, ropes jumps, balance poles etc. The course is set up for timed individual runs or challenges between two teams in parallel. Without detracting too much from the fun and challenge we have laid bark chippings on sand under the higher elements, but it goes without saying that accidents could happen so all activity on the course must always be properly supervised. There is also an area for small people (Beavers and Cubs) at the side of the Adventure Course. The ‘bomb hole’ is our water feature, the depth of which varies by season. When full the level is between knee and waist depth and suitable for bridge building or mini-raft building activities. This is also situated within the fenced activity area and, like anything involving a body of water, is for properly supervised activities only. Risk Assessment for use of the Adventure Course is the responsibility of the Group Leader and Activity Supervisor.